I recently fulfilled a dream of 35+ years – to visit the Kingdom of Bhutan where its enlightened, conscious leader and 4th King had bravely pioneered the concept of “Gross National Happiness.” I was given the privilege of giving the opening keynote at PATA’s conference on Adventure Travel and Responsible Tourism – the speech is on slide share here. 1. Well-being. 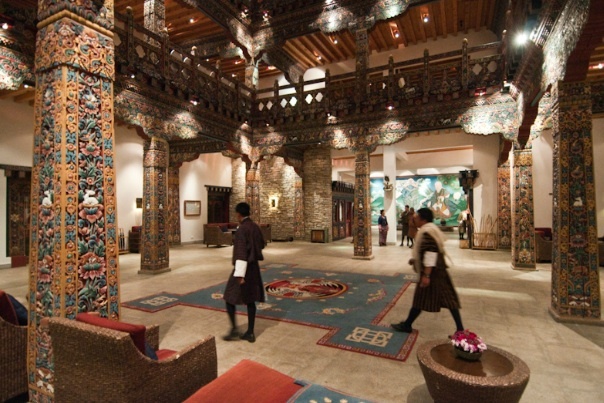 In Bhutan, tourism is recognized as one means towards achieving and sustaining the well-being of its citizens. As a consequence, tourism is not just about growing GDP, or increasing volume. All policies with respect to its development are viewed through the lens of 72 Gross National Happiness Indicators based on the four pillars of GNH (ecological balance; cultural vitality, sustainable, equitable economy and good governance). As Bhutan is still listed as one of the Less Developed Countries of the world, with an estimated 23% of its population living below the poverty line, it needs to develop its economy in order to improve its well-being and tourism is the fourth contributor to GDP. Despite these economic pressures, Bhutan is committed to pacing the growth of tourism to ensure that it doesn’t diminish cultural or environmental values. 2. 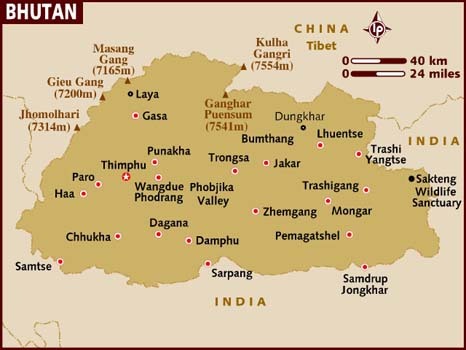 Place: The Bhutanese people and their leaders intrinsically recognize that Bhutan (like any other country, or region) is unique and its value lies in its location, geology, geography, landscape, history and living culture. Because they value themselves and the place they call home, they have never discounted its value and taken sensible steps to ensure that tourism is developed at a pace that doesn’t undermine its culture. Up until the early 1990s, a tourist quota was imposed in addition to a minimum daily tariff. All visitors are required to plan their travel with the assistance of a Bhutanese tour operator who arranges and supplies accommodation, food, transportation and guiding services for a minimum daily fee of US$250. Of this fee, a $65 royalty is paid directly to the Government to fund health and education. Every visitor has personal access to a trained, educated, English speaking guide whose intent and purpose is to ensure that the visitor experience is transformative. The daily tariff ( US$250 per day) has not only controlled the pace of growth but has shown visitors how their spending directly affects the quality of life experienced by their hosts. Bhutan’s recognition of the “power of place” and its commitment to expressing its unique spirit is perfectly reflected in their choice of branding “Bhutan – Happiness is a Place” – a tagline which is a truthful distillation of what Bhutan is all about and what the country means to its people. No sane person would deny the right of the Bhutanese to lift their people out of poverty and increase the quality of their lives. Nor do westerners like me have any right to impose our nostalgia and grief at the loss of so much cultural diversity elsewhere in the world on the inhabitants of this little country. But the healthy sense of self worth exhibited by the Bhutanese suggest to me that this is a living, dynamic culture capable of balancing the need to both preserve, conserve and adapt. Located in between two of the most populous, fastest growing economies of the world (India and China), it would be tempting to open the gates and maximize visitor volume. Instead, Bhutan has increased the minimum daily tariff (from US$200 to US$250) and set itself a modest growth target of 100,000 visitors by 2015. Its first priority is to ensure that the existing, active 320 Bhutanese tour operators and 120 accommodation suppliers are operating healthy sustainable businesses and contributing to the vitality of its communities. 4. Value: Bhutan tries to give its guests good value while ensuring that tourism generates net value to its citizenry. The minimum daily tariff that all operators must adhere to makes it difficult, if not impossible, for price discounting to be used to gain market share. Instead, the inbound tour operators and suppliers of accommodation, transport and guiding services, must compete on the basis of service quality. Customer satisfaction, as expressed to the inbound tour operator, provides the “feedback loop” which determines which suppliers will be used the next time. 5. Local & Authentic: Visitors to Bhutan can be assured that their visit benefits locals as the inbound airline, all accommodation, and all inbound tour operations are locally owned and managed. Most of the food served is locally grown and prepared. (Bhutan intends and is working hard to ensure that its agricultural sector is 100% organic). Its attractions are primarily natural sites (trekking & wildlife viewing) and cultural/spiritual sites (monasteries, fortresses; memorials) or activities (Festivals) that are locally funded and managed. Bhutan is a living culture that invests in developing the artistic skills of its young. 6. A Place That Cares: for such a young country (Bhutan only switched from a theocracy to modern, parliamentary democracy in 2008), it demonstrates a remarkable maturity that reflects its cultural/spiritual values of service, compassion, personal responsibility and caring. Three examples support this observation. The Host as Change Agent. The work undertaken by Zhiwa Ling and Yangphel is truly inspiring – fortunately they have also documented their experience in an excellent case study available here. • Care deeply for others and their natural world. Since it is the graduates of this education system who will be running Bhutan’s tourism economy in the future, I have every confidence that the country will sustain its position as first Conscious Travel Destination!! Bhutan is also committed to maintaining the pristine nature of its natural habitat through careful forestry practices (a permit has to be obtained to cut down a tree and 8 have to be planted in the place of one); 70% of the land area is untouched; and all food production will be organic. 7. Pull not Push: the hallmark of a Conscious Travel Destination is its ability to attract the right customer – the visitor whose values match those of the host. Bhutan isn’t for everybody. Bhutan is for the visitor seeking a unique, and some would say, exotic experience of a vibrant culture expressed in a pristine setting. The Bhutanese appear very comfortable in their own skins; they know who they are and what they value and this comes through in all the media now available to express that identity. For a country that only got TV and the Internet in 2006, its tourism operators are proving remarkably competent and gifted in digital marketing. Because an understanding that all sentient beings are connected and interdependent is an integral to Bhutanese philosophy, the concept of social business or social marketing comes naturally. The Bhutanese tourism community has both the mindset and the social intelligence to operate as a social business and I see no reason why they won’t become leaders in this aspect of tourism management as well. This post is not meant to imply that all is perfect in Bhutan. The moniker “Shangri-La” will likely do more harm than good. Like many developing countries its population is rising faster than the economy can expand to develop sufficient jobs and unemployment rates among the young are on the increase. Young people are leaving the remote rural villages for the main centre Thimphu leaving the villages and agricultural production to an aging population. The visa/ tariff requirement does not apply to Indian nationals and Indian tour operators are keen to exploit destinations that would appeal to its growing middle class. Even though licenses are required to open a hotel or operate an inbound tour business, their number and capacity currently exceeds current demand so these operations are operating at low levels of occupancy and efficiency. The challenge will be to resist pressure to lower the tariff (institutionalized discounting) or allow construction of attractions and facilities not in keeping with the unique essence of the place. Given these characteristics, Bhutan is a perfect destination for many “conscious travelers” many of whom are more likely to discover the country through stories about its pursuit of Gross National Happiness than through the traditional wholesaler/retailer channels. 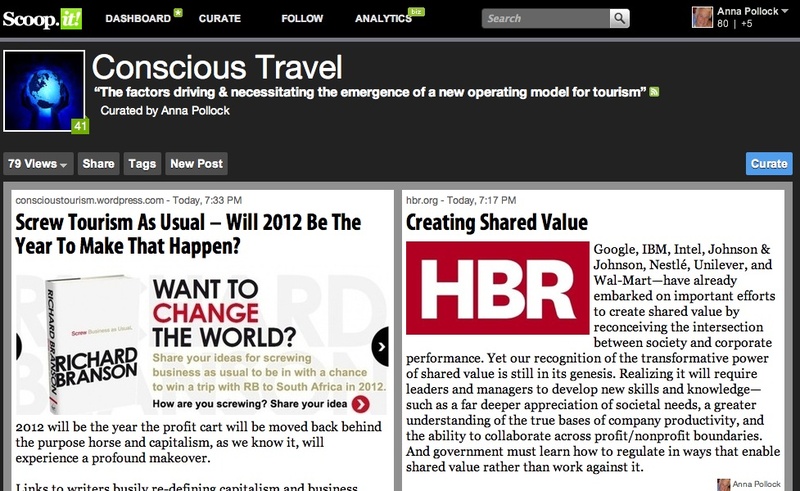 The latest issue of Conscious Travel Scoop.it! is out with a focus on the changing role of business; the growing interest in Bhutan’s Gross Happiness Index and discussions regarding the feasibility of sustained economic growth in a world of finite resources. Click here to read. Below is an image of the latest front page.